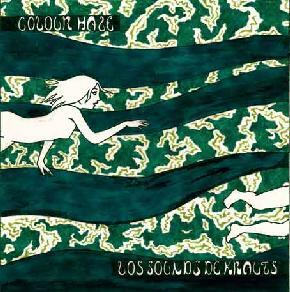 Colour Haze - "Los Sounds de Krauts"
Wow... What an amazing double LP. The CD is not yet released but will soon be out on Elektrohash records. If you have never heard Colour Haze, then you are in for a treat. The band have a unique groove that mixes that 70s sound with the more modern stoner rock sound but the songs are excellent and the band really get hypnotic and go way out into experimental songs (like the good old Kraut rock of the 70s, hence the title!) as well as straightforward rockers like the opening "I Won’t Stop". This song is a real jammer live! "Roses" is next and has a great bass line and tight drumming and the song just slowly builds up and the band just takes off. A heavy groove number. "Zen" also starts off with some great bass (Philip) and drum (Mani) interplay and is sort of a sister track to "Roses" (the band often play them together live as well). While "Roses" is total groove numbers, "Zen" really shows Stefen rip it up on the guitar. Stefan plays guitar in a very unique style of his own, with a little bit of Jimi Hendrix, some jazzy stuff, and some heavy Josh Homme style sounds. Amazing song! End of side 1! "Plazmakeks" starts slow, really slow, and is a real listening song. Just sit, listen and go with the flow and be taken away to 1972 when life was much more free and flow with the guitar, bass and drums. Amazing song and fantastic layered guitar solos! "2+7" is next and a short pop (?) song. A short feel good sit in the sun rocker. "Sundazed" starts off with some nice Hendrixy guitar before a hypnotic groove takes off and the band really grooves. I love the way Stefan plays the guitar tone. Side 3 begins with "Where The Skies End", the only stoner-pop song on the record. Stefan’s singing has really improved greatly on this record. A cool groovy number. Next up is the Kraut rock number of the record, "Weltraummantra" (18 minutes!). It starts very slow and quiet and then the first break totally reminds me of "Strange Universe" by Frank Marino (I asked Stefan and he had never heard it!). Some nice Hendrix style guitar. The band brings it back down into a steady groove before Stefan brings the whole thing back into the "Strange Universe" vibe and just completely goes off into space. Amazing piece of music but you must be patient to reap it’s reward! Side 4 begins with "Other Side" and is a 2:15 long headbanging number. Plain and simple. "Overriding" is another long (17:15 minutes) and another journey that starts very slow with great interplay between the drums and bass while Stefan plays slowly over the top. The heavy riffs come in around 4½ minutes and Stefan starts singing. The track really takes off and there is some organ guitar interplay while Stefan sings in the background. A really true 70s sound. This amazing double LP ends with "Schlaflied", a mellow emotional song like "Little Wing". This will be released on CD on the Elektrohasch label this summer. Visit the Nasoni Records web site at: http://www.nasoni-records.com, and visit the Elektrohasch web site at: http://www.elektrohasch.de.